Candlewick Press (MA), 9780763624491, 40pp. Step aboard, buccaneers and book lovers Comically dramatic illustrations set the tone for this humorous, hare-raising adventure on the high seas. "BATTEN DOWN THE HATCHES "
Aboard a ship called the Salty Carrot sails a wild, rowdy band of Buccaneer Bunnies. Their leader, Barnacle Black Ear, is the baddest bunny brute of all time, but his son refuses to perform his proper pirating duties. Henry would rather read books than shout "Shiver me timbers " or make prisoners walk the plank even if it means he has to swab the decks as punishment. But when a crashing, bashing, thrashing wildcat of a storm threatens the Salty Carrot and its crew, will Henry and his landlubbin' library save the day? Carolyn Crimi, AKA the Pirate Queen, is the author of numerous books for young readers, including BORIS AND BELLA, illustrated by Gris Grimly. 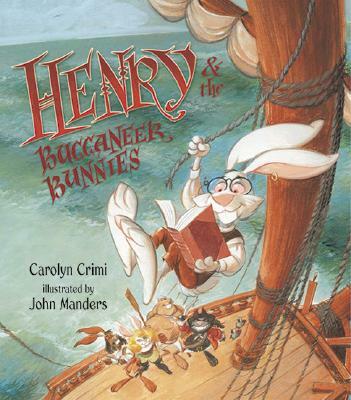 Of HENRY AND THE BUCCANEER BUNNIES, she says, "While I don't have long floppy ears or a pro-nounced overbite, Henry and I are kindred spirits, who love books and carrots!" John Manders thief, pirate, rogue, and children's book artist has illustrated several books for children, including MINNIE'S DINER: A MULTIPLYING MENU by Dayle Ann Dodds and SENOR DON GATO: A TRADITIONAL SONG. He says, "I began my nautical career with my faithful parrot, Sherman, plundering merchantman and man-o'-war alike. From piracy, it was a small step to children's book publication." Today John Manders lives in Pennsylvania, far from the ocean's beckoning waves."